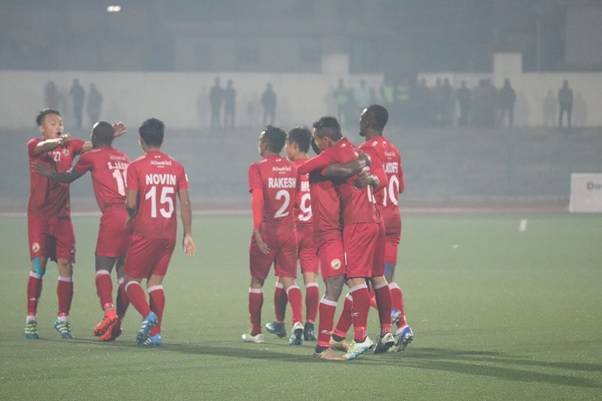 The mercury dipped sharply at Shillong in the cold evening but the chill did not deter Lajong to come out all guns blazing to script a 2-1 win over Aizawl FC. Deemed as the “North East Derby”, this fixture has a history of producing something dramatic as two sides came out to exert dominance over the other. Two second-half goals from Abdoulaye Koffi and Saihou Jagne paved the way for a thrilling 2-1 win, as Dodoz managed to pull one goal back for visitors in the 95th minute. The first half saw both teams playing compact football and not pushing high to leave space for the opponents to exploit in the attacking third as Lajong and Aizawl defended deep and tried to break on the counter. In the first half, it was a very tight game but Lajong enjoyed better ball possession and looked more penetrative on the break. Both teams went into the halftime break goalless, post a barren first half. Lajong introduced Abdoulaye Koffi in place of Kynsailang Khongsit at the break to add more venom to their attack. Koffi had an impact soon after coming as a substitute as Lajong got Aizawl defenders found out wanting, using the long ball to utilize the space behind the Aizawl defenders who came out attacking in the second half. The goal finally came in the 57th minute from Saihou Jagne’s cross, delivered with artistic precision from the right flank found Koffi left unmarked behind two Aizawl defenders. Koffi timed his jump perfectly to head the ball beyond Avilash Paul to give Lajong the opening 1-0 lead. As Aizawl FC started to push forward and playing a high line looking for an equalizer, Saihou Jagne found space on the right to run towards the goal and rode an attempt to intercept from Alfred Jaryan as he found himself in a one-on-one situation to chip the ball calmly at the back of the net to make it 2-0 for the Lajong on the 73rd minute. Backed by the vociferous crowd and the beating drums Lajong looked to cruise to a comfortable win but Aizawl managed to pull one back to make it 2-1 on the 95th minute as Dodoz scored a poachers goal to tap in Nidhin Lal’s half stop from Ionescu’s shot to give Lajong a few nervous last minutes. But Lajong managed to hold on to their lead to make it home with a 2-1 win as they travel to Kolkata for their last game of the season against East Bengal on 4th March at the Salt Lake Stadium.